Volunteer with one of the most trusted organizations in the Northern Virginia area. You’re just four easy steps away from joining the 1,200 individuals who volunteer each year at Carpenter’s Shelter. After you submit your application, you will be contacted with available orientation dates within 5 business days. While you are waiting to attend orientation, please complete your background check by visiting www.mybackgroundcheck.com. Please note: background checks cost $8. Additional charges may occur if criminal charges are present. Questions about volunteering? Contact our Volunteer Coordinator, Jamila Smith, or give her a call (703) 548-7500 x213. Individuals needed to serve at our seasonal shelter to help set up beds, assist with intake and process paperwork. Available shifts: November through April (weather depending) 7 pm-9 pm daily. Volunteers assist the program staff in delivering services to members of Carpenter’s drop-in day shelter for the chronically homeless. Projects include: membership intakes, laundry services, coffee and snack set-up, answering phones and monitoring member activities. Individuals serve as the shelter receptionist: answering phones, greeting visitors, and receiving donations. Individuals to assist in the administrative office with mailings, special event preparation, data entry and more. Flexible weekday hours available. Job Coaches: Volunteers meet one-on-one with residents seeking to find or retain employment.Coaches assist with resumes, employment applications, and job search skills. For more information, please contact Housing Locator Kaitlyn Massa. Meals: Volunteers donate, prepare and serve meals to residents. Lunch and Dinner are served daily. A hot breakfast is served on the weekend. Great for organizations and groups. Pantry: Volunteers needed to organize and clean out Carpenter’s pantries. Refrigerator: Volunteers needed to organize and clean out Carpenter’s refrigerators. Groups organize a large service project for Carpenter’s Shelter. If you’re interested in hosting an event like this, please contact Volunteer Coordinator Jamila Smith to discuss opportunities! Lawn Maintenance: Groups and individuals maintain our property by mowing the lawn, landscaping, raking, removing snow and up-keeping the playground. Hours are flexible. Day of Caring: Groups and individuals can dedicate a day or afternoon to serve at the shelter. Project vary, but may include: pantry clean up, deep cleaning, painting, organizing, or seasonal opportunities. Hours are flexible. Children’s Hour: Volunteers facilitate meaningful activities with shelter and Community Case Managed children while their parents are attending class. Field Trips: Volunteer groups are invited to plan, sponsor, and facilitate weekend outing for children staying at the shelter. 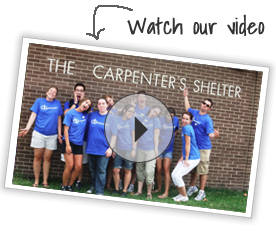 Interested in hosting a service day at Carpenter’s Shelter? Contact our Volunteer Coordinator, Kelly McDermott, to see if we can accommodate your group!